Every school year, we run the European Astro Pi challenge to find the next generation of space scientists who will program two space-hardened Raspberry Pi units, called Astro Pis, living aboard the International Space Station. 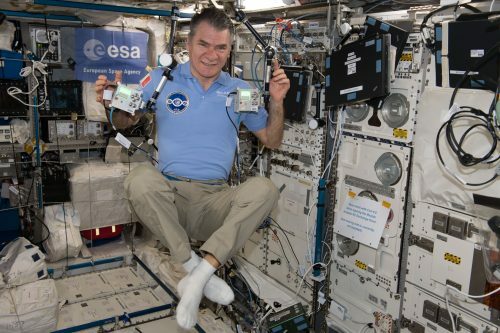 Italian ESA Astronaut Paolo Nespoli with the Astro Pi units. Image credit ESA. The 2017–2018 challenge included the brand-new non-competitive Mission Zero, which guaranteed that participants could have their code run on the ISS for 30 seconds, provided they followed the rules. They would also get a certificate showing the exact time period during which their code ran in space. We asked participants to write a simple Python program to display a personalised message and the air temperature on the Astro Pi screen. No special hardware was needed, since all the code could be written in a web browser using the Sense HAT emulator developed in partnership with Trinket. We received over 2500 entries for Mission Zero, and we’re excited to announce that tomorrow all entries with flight status will be run on the ISS…in SPAAACE! There are 1771 Python programs with flight status, which will run back-to-back on Astro Pi VIS (Ed). The whole process will take about 14 hours. This means that everyone will get a timestamp showing 1 February, so we’re going to call this day Mission Zero Day! Part of each team’s certificate will be a map, like the one below, showing the exact location of the ISS while the team’s code was running. The grey line is the ISS orbital path, the red marker shows the ISS’s location when their code was running. 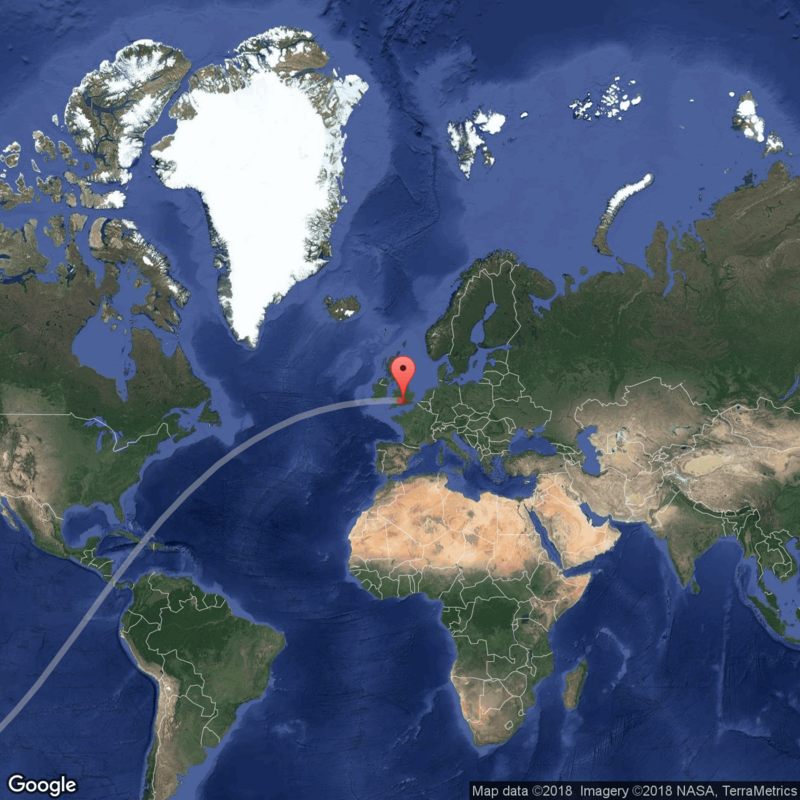 Produced using Google Static Maps API. The programs will be run in the same sequence in which we received them. For operational reasons, we can’t guarantee that they will run while the ISS flies over any particular location. However, if you have submitted an entry to Mission Zero, there is a chance that your code will run while the ISS is right overhead! Spotting the ISS is a great activity to do by yourself or with your students. The station looks like a very fast-moving star that crosses the sky in just a few minutes. If you know when and where to look, and it’s not cloudy, you literally can’t miss it. Source Andreas Möller, Wikimedia Commons. 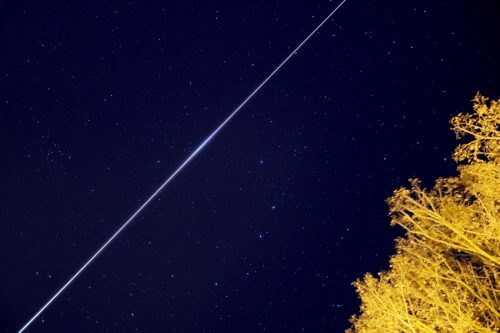 The ISS passes over most ground locations about twice a day. For it to be clearly visible though, you need darkness on the ground with sunlight on the ISS due to its altitude. There are a number of websites which can tell you when these visible passes occur, such as NASA’s Spot the Station. Each of the sites requires you to give your location so it can work out when visible passes will occur near you. 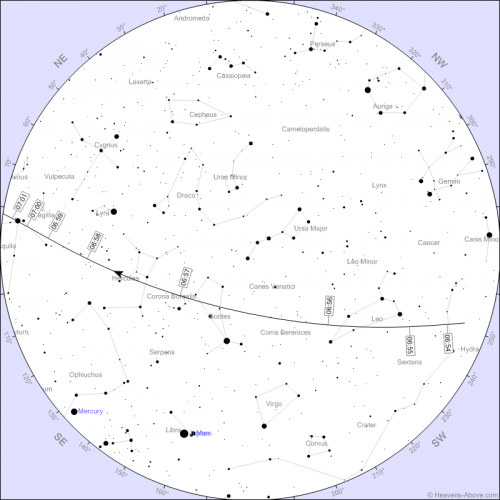 Visible ISS pass star chart from Heavens Above, on which familiar constellations such as the Plough (see label Ursa Major) can be seen. If you go out and do this, then tweet some pictures to @raspberry_pi, @astro_pi, and @esa. Good luck! 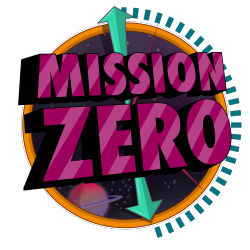 Mission Zero certificates will be arriving in participants’ inboxes shortly. We would like to thank everyone who participated in Mission Zero this school year, and we hope that next time you’ll take it one step further and try Mission Space Lab. Mission Zero and Mission Space Lab are two really exciting programmes that young people of all ages can take part in. If you would like to be notified when the next round of Astro Pi opens for registrations, sign up to our mailing list here. Did it all go well? How do they get the certificate, my son can’t remember. Hi Ben, they will be sent via email to the teacher that registered the classroom code. I submitted an entry for a team, but haven’t received any notification that it will run. Not sure whether I should have had something and the website just says that it is closed for entries. Hi Stewart, you should have received an email last year with a flight status report. Anyway, I can confirm that you have one entry that was indeed run on the ISS so you can expect a certificate to come through soon. Thanks that’s great news. Look forward to receiving that. My Son is very proud of his certificate. I like the fact that all participants had their code run in space a great achievement for all involved.